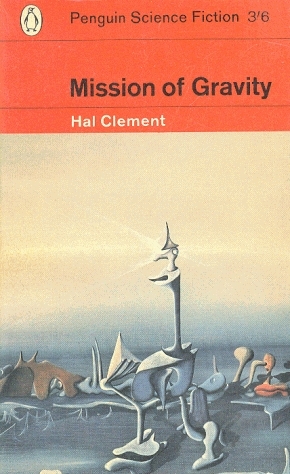 Hal Clement’s Mission of Gravity (1953) is generally considered one of the early classic (and most influential) novels of the hard science fiction subgenre. The care in which Clement lavishes on the fascinating world of Mesklin is manifest on virtually every page. The inherent logic of the unusual scientific properties of the planet Mesklin provides the superstructure for Clement’s development of the intelligent species that inhabits it and generates the majority of the plot. Clement, a Harvard educated astronomer, applies the (remorseless) logic of the world to almost every situation and every paragraph creating a convincing, if rather laborious and dry, reading experience. As a reader (albeit I am one who did not become devoted to science fiction through any interest in science), this technique can be incredibly taxing but Clement does intrude on his scientific extrapolations with a few fascinating societal observations. A more frustrating theme becomes quickly apparent: Clement believes that all aspects of how a society functions and views itself are the result of purely scientific phenomenon. I have rarely read a work where nomological determinism was so rigorously applied (take this as you will)! Thus, all development paths of Mesklinite society are solely rooted in and guided by scientific causes. 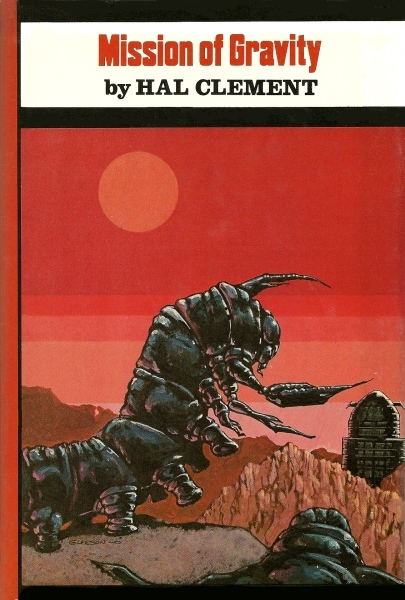 Or, one might argue that Clement’s descriptions of his alien culture and society never move beyond simple discussions of how the scientific properties of Mesklin have shaped them. Religion and other influential cultural constructions are absent. The Mesklinite culture does change but only due to the fact that the humans have educated them about the scientific properties of their own world. The ramifications of the “act” of first contact, the unequal intellectual relationship that is established, and the clearly superior knowledge of the humans appear as mere afterthoughts in Clement’s narrative. Our Mesklenite hero does demand a more equal relationship but he is clearly the eager student asking his professor to actually tell him how the atom actually works. Once again, the worldview of the Mesklinites change but Clement chalks it up solely to the increased scientific knowledge they acquire about their world. Mesklin is a spheroid shaped planet with incredibly fast days (around eighty Mesklin days in twenty four Earth hours). At the poles the gravity is an incredibly 700g — at the equator a mere 3g. Extreme conditions — liquid methane, frozen ammonia — create difficult surface environments for non-natives. Human explorers, who have established a research base on an orbiting moon, are only able to land one astronaut (by the name of Lackland) at the equator with special equipment to survive in the gravity. By chance Lackland encounters a member of the Mesklinite race named Barlennan. Barlennan is a fifteen-inch long caterpillar-like creature (who weighs hundreds of pounds) who travels across the surface of Mesklin in a special sailboat looking for rare materials. His race normally lives closer to the poles. Due to the fact that they are from the areas with incredible gravity (700gs) they do not have a concept of flying, throwing, etc. All things that are virtually impossible and could easily result in their deaths (falling a mere inches would kill them). Barlennan and Lackland become friends and soon the Mesklinite learns English. I found aliens as friends/partners a very appealing and refreshing position to take. Too often aliens are the evil that must be destroyed — especially in science fiction from this era (and earlier). Barlennan spends a great deal of his time on a ramp looking into Lackland’s habitation watching educational videos and engaging in conversation. Lackland spends most of his time floating in a special pool of water to combat the stresses of the gravity. Soon the real reason that the humans have landed on the planet are revealed — an important scientific probe has landed in near the pole and the humans need assistance to recover the information it contains. This one really blew my mind when I read it thirty-something years ago. The fact that it was told from the native’s POV, the crazy physics, the way the environment changed as they changed latitudes. This was one of the ones that made me want to write SF. I wonder how it would hold up if I reread it now? Well, I suspect you’d find it rather dry. I too, at my age (well, still in my 20s) found it rather transfixing for the first third. Then the dry prose and the 50s view of science really bugged me…. And how Mesklinite culture seemed to be only determined by what they knew scientifically about their world… Still a worthwhile read. Give it a shot (again)! 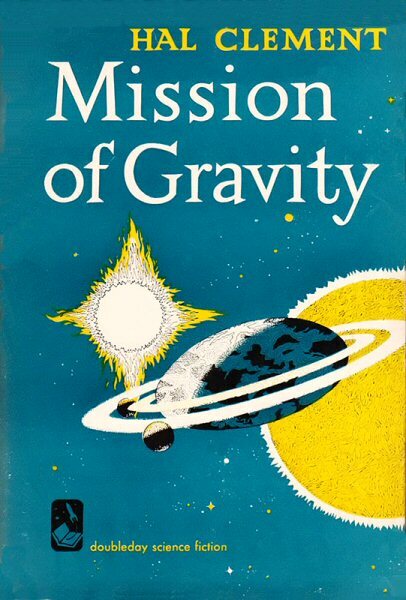 I read the hardcover 1954 edition of Mission of Gravity in the last ten years or so, and I enjoyed it, but it is not the kind of thing I expect to read again. I probably won’t either. I have the Pyramid Books 1962 edition — with the Emshwiller cover. Despite its problems, I’m still glad that the book has remained in print and was picked up in the last few years by the Gollancz masterwork series. Nice review! 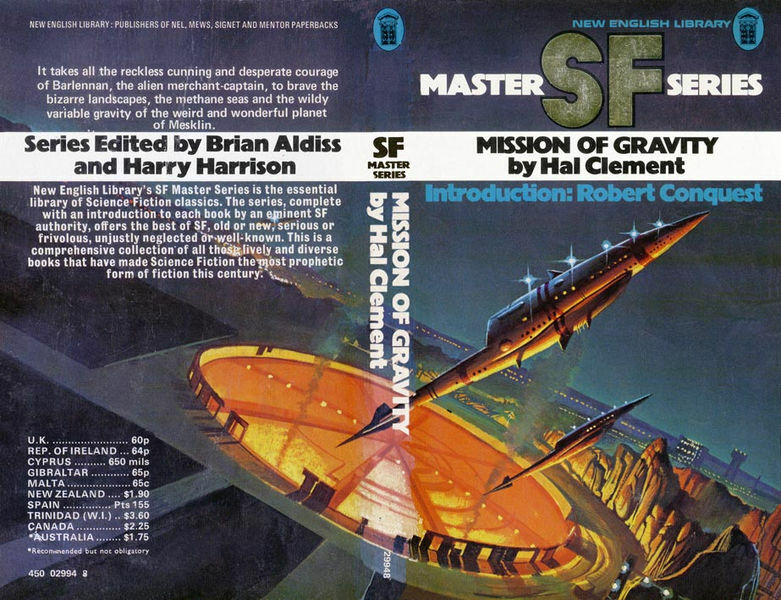 The whole book really is an excuse to work out a series of physics problems on a unique world – I can see how that would have thrilled the typical reader of 50’s SF magazines, because Clement creatively used physics many of them would have recognized. I wonder if the author’s scientific tunnel-vision was not only a product of his time, but also a character trait. Maybe he was just a huge science nerd, with little literary training. There was good literature from the ’50’s, with strong characters and social commentary. It just wasn’t sci-fi and he just wasn’t interested. I enjoyed your review. I’ll the book to my list of future maybe-reads. The Tony Gleeson cover makes it look like the locals are dangerous monsters intent on attack, and the Dongen cover is as you say hideous. The 1954 and 2005 ones are I think my favourites, though the ’68 and the Dongen ’72 aren’t bad. I haven’t read this, though I’ve tried. I think I found it so dry that I just sort of bounced off. I still have a copy so I’ll likely try again, but perhaps more because of its historical importance than any great enthusiasm for it as a book. 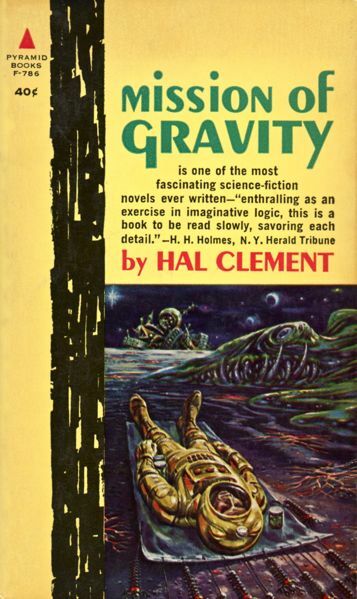 Well, it certainly is dry — but then again, I find most hard science fiction unreadable. So it better be the early stuff…. But yes, I would suggest that it is worth reading due to its historical importance and its treatment of the aliens who are definitely friends of the humans — although they do encounter aliens with more evil intent on their journey across the surface of Mesklin in search of the probe. I don’t think I’ve ever seen a Wallace Wood PB SF cover before – I always liked his comic book art. Do you know of any others he did, Joachim? Yes, he did quite a for the Galaxy Novel series in the 50s and early 60s …. Here’s his listing on isfdb.com — I highly recommend the site if you don’t know about it. You can search by author, artist (if credited), etc. 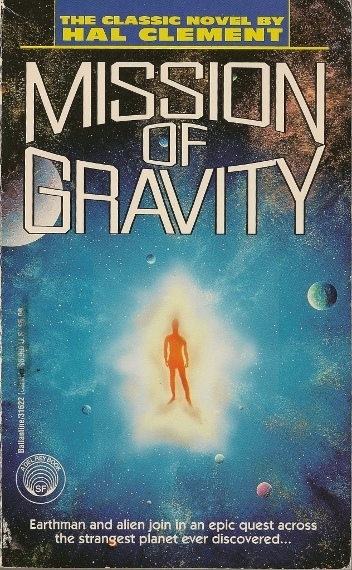 I tried reading Mission of Gravity once, but quickly became bored with it. Like you, I’ve never read SF for the science. I did enjoy Clement’s Needle though. Perhaps because, in the case of his first novel, he was able to just tell a good story without also having to detail the science behind its setting: Earth. I recently bought the Avon paperback of Needle, the 1967 printing. I think I will promote it to the top of my reading pile. I read Needle some time back. I loved the initial section with the Hunter learning about Earth and humanity, but thought that the rest of it wasn’t quite as good. The sequel is slightly better in my opinion; have you ever read that? 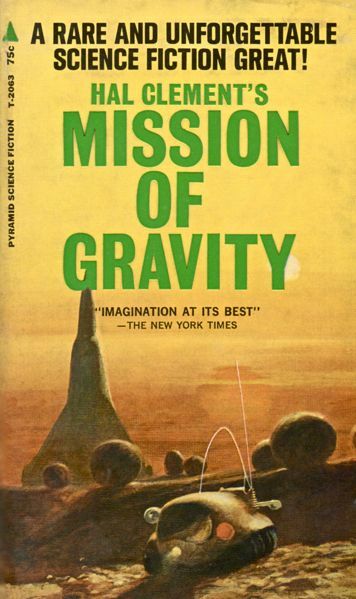 I’ve only read Mission of Gravity and Ice Planet (one of my oldest reviews on the site — and not that critical — haha). I just procured Close to Critical. But, haven’t read Needle yet. I wonder which novel Lehr’s 1974 cover was originally done for – with its undersea cities and submarines? 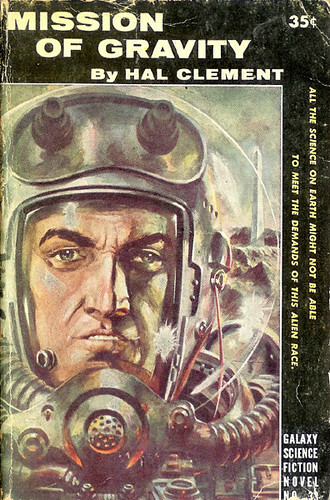 It was done originally for the 1971 edition of Dean McLaughlin’s Dome World (1961). A much better suited book…. I think it takes place underwater but I haven’t read it. Yes, according to SFE, it takes place underwater. 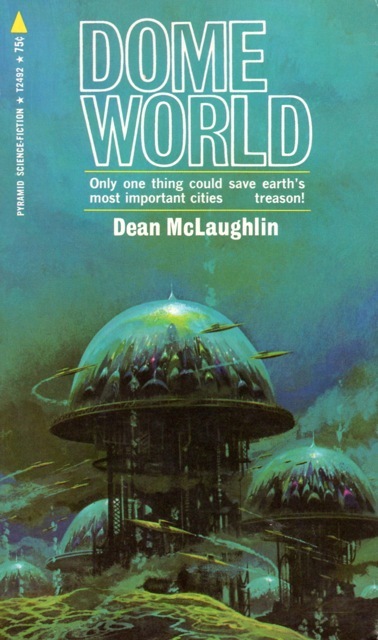 They also say McLaughlin’s books are examples of Libertarian SF. Ugh. I’ve never read this book, but I have read both Needle and its sequel. I enjoyed them both, though I also found Clement’s style to be rather dry at times. This book actually sounds more interesting than Needle, so I’ll be sure to check it out in the future. Thank you for posting this review. You’re welcome. Needle is probably more historical relevant for the genre due to its earlier publication date…. I have the sequel on my shelf but it’s from the late 70s. Supposedly, Needle inadvertently invented the word “symbiote”. I’m not sure if that’s true, mind. Either way, I get the impression it was pretty influential back in its time. That’s interesting about Needle and the word “symbiote,” theparasiteguy. 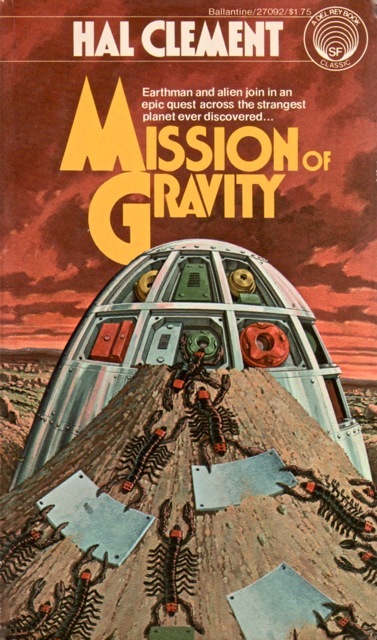 I heard an interview with Gene Wolfe today where he mentioned that Jack Williamson coined the term “Terraforming,” which has entered into the vocabulary of science. I know Capek coined “Robot,” it would be interesting someday to try to compile a list of SF buzzwords that have become part of the vocabulary of “real” science. “Multiverse” might be another one. The funniest thing about Needle is that “symbiote” isn’t even the right word. The correct word is “symbiont”, but the former had already caught on in the genre by the time Clement noticed the mistake. I imagine that many, many such buzzwords exist. It would also be neat to make a list of real-world technologies that were first predicted by SF; the number is probably just as high. Good lord. That is…quite extensive. Bobby Trosclair, can you direct me to a place I can hear that Wolfe interview? I’m a big Wolfe fan, and am wondering if the interview you mention is one I have not heard. BTW, I am on page 92 of Needle and I like it. I also have the sequel on the shelf. mporcius, it’s a podcast interview on the “Notes from Coode Street” podcast, Episode 128, “Live with Gene Wolfe”. You can download it for free on iTunes. 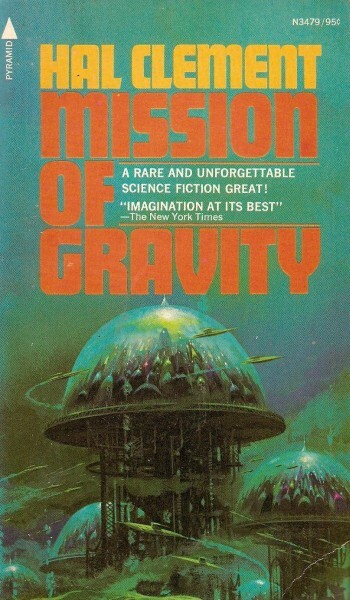 Overall, I would say that MISSION OF GRAVITY gets some very good cover illustrations. And the 1962 edition has a pull-quote from “H. H. Holmes” (Anthony Boucher, using his pseudonym, which is also the name of America’s first notorious serial killer), no mean authority on the literary merits of sf/f.